This week saw a couple teams take a breather after last weeks inaugural races. Teams like Trinty, St. Xavier did not compete this weekend. Next weekend will be a big one for many teams as they head to one of the NINE meets across the state, including big ones like Rumble Through the Jungle, Bluegrass Invitational, and Mason County. Did I mention that we are doing something really cool at Rumble Through the Jungle coming up this weekend? If you haven't seen it, check out the article HERE! Ok, enough about what is coming up, let's recap the past weekend. My highlighted meet of the week is the Central Kentucky Run for the Gold hosted by six schools in and around Hardin county. This meet was one of the coolest cross country meets I have attended. It *almost* made me want to throw on some flats and run the open race...more about that later. 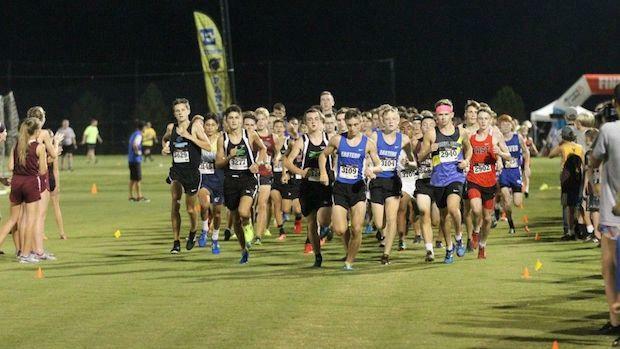 The varsity races were run completely under the lights and provided for an incredible environment to race. The weather was perfect and the crowd was electric. If you ever get a chance to take your team to this meet, I highly recommend it! Now, to the action on the course. Christian Parker of Madisonville-North Hopkins went out quickly and never relinquished the lead. There was one point about a mile and quarter in that Jonah Mitchell of Muhlenberg County, the eventual runner up, surged beside Parker, but his move was quickly matched and Christian never looked back. He won the race in the top of the week at 15:41 to Mitchell's 15:57 (third best time of the week). Parker's teammate Garrett Watts placed third in a solid 16:07. The team race was a nail biter as Central Hardin squeaked out a two point victory over Madisonville-North Hopkins, 99-101. These two teams took a very different approach to the race as Madisonville-North Hopkins was very top heavy while Central Hardin was a tight pack. Possibly the biggest surprise team of the early season has been Lafayette. They have been 3rd at the Central Kentucky Run for the Gold and were 11th at the Tiger Run. Why is that a surprise you say? Well last season they were 23rd at the state meet and already this season they are ranked 11th in class AAA (See the entire current team rankings for class AAA here). The Henry Clay/Tanner Duke Invitational gave us our first look at the top returning runner in the state, Paul Dunbar senior Austin Mathews. He did not disappoint as he coasted to a 15:58 win outrunning newcomer Levi Streeval of Frederick Douglass. Austin picked up right where he left off as his first time last season was at Bluegrass Invitational in 15:53. Imagine how fast he would have run if he went to Central Kentucky Run for the Gold, right Austin? The story of this meet might be the runner up position from Frederick Douglass. In only their second season, they have found a stud. Levi Streeval is a freshman who recently moved to the Lexington area from Missouri. His sister was the runner up in the girls race behind Syndee Meadows. Levi ran the Midsummer's Night Run back in early August in 17:04 and now has dropped 21 seconds on a course that is not traditionally fast. I am not saying that he could catch Austin, but the rest of the central Kentucky area needs to be on notice. This kid is the real deal and is currently ranked #1 in Kentucky for freshman above names like Dalton Lesher and Blake Whiteley (who have been mainstays in Kentucky middle school track and field). Oldham County cleaned house on Saturday at the Shelby County Invitational. They won the team race by 38 points (33-71) and scored 24 points to win the JV race. The varsity squad was led by senior Jacob Brizendine who won by 38 seconds (16:10 which was the #6 fastest time run in Kentucky this week) over the second place Griffin Staude of Western Hills. The Colonels of Oldham County had all five scorers in the top 13 with Spencer Harvey, Isaiah Cook, Luke Payne, and Caleb Lohr being the scorers this week. South Oldham's Nathan Quinn was third overall in 17:20. Austin Stallings followed up his runner up finish at the Tiger Run last week with his first win of the season at the Wildcat Wilderness Invitational. Austin covered the 5K course in 16:16 and led his Owensboro Catholic team to a narrow victory in the team race (43-47) over Bowling Green. The Purples were led by a 6th place finish by Mike Kanan. The second place finisher in the race was Ohio County senior Kyle Embry who improved on his 4th place finish time at Madisonville Classic last week by 22 seconds. Rounding out the top three was Logan County's John Hendricks. Covington Catholic went into the Grant County Invitational with a mission to take the team title and they did so in dominating fashion. Cov Cath won by 109 points over second place Williamstown. The Covington Catholic squad was led by Will Tate with an impressive 17:07. The senior laden team placed all five scorers in the top 16 with their first three being twelfth graders (Will Tate -1st, Casey Wolnitzek - 3rd, and Ben Hail - 5th). Dixie Heights had the second place finisher in Evan Padgett with a huge improvement from last week's Trimble County Backwoods Invitational time (18:28 to 17:32). The Christian County Invitational did not have flashy times, but it was not absent of impressive performances. The boys from South Warren took the team title with 27 points and the next closest team, Webster County, had 105. The individual title went to Chase Atkins of Hopkinsville, who has steadily improved his placements in his first three races (15th to 6th to 1st), in a time of 17:16. Following Chase was a trio of South Warren runners with Kyle Woodward, Peter Furgal, and Luke Wininger. The last meet in Kentucky to highlight was the Catbird Classic hosted by North Laurel. This finish was intense and was only separated by 0.47 of a second as Sean Simons of Corbin out kicked Caden Miracle of Bell County. There were a number of teams that traveled outside of the state to get some other competition. Meets that Kentucky teams attended included: Brooks Memphis Twilight XC Classic (TN), St. Mary's Medical Center XC Festival (WV), and Ripley Invitational (OH). The biggest result our of these meets was Holy Cross (Louisville) performance at the St. Mary's Medical Center XC Festival hosted by Cabell Midland. Keeton Thornsberry won the A/AA Varsity race besting his time from Tiger Run with a 15:50 (good for the #2 time run by the Kentucky runner this week). Not only did he dominate by winning by 37 seconds, but he also set the course record. Add in his teammates and the Cougars won the team title 58-91 over Winfield High School. Caleb Bolus was 3rd overall in 16:30 and Lexington Christian's Andrew Madden was 4th overall with a time of 16:33. Holy Cross' team performance was good enough to make them the top team of the week through the results merge. The weekend team title went to Oldham County with all of the times scored as one meet. Check out where your team ranked this week HERE! Daviess County traveled to Memphis for the Brooks Memphis Twilight XC Classic and had a 13th place team finish with Brady Terry as their top runner placing 20th in 16:54. Mason County went north to Ohio and placed 4th as a team at the Ripley Invitational. Their top runner was Isaiah Riggs who took second place overall in 18:13.